Three years ago, shortly after I joined Science Centre, I learnt about the last total lunar eclipse of 2011 on 10 Dec 2014 and managed to enjoy the eclipse process with my husband and friends at the Jurong Lake Park. We had coined it as a “Once in a red moon” affair back then as we learnt that the next total lunar eclipse visible from Singapore would be in 2014. I was pleasantly reminded of the eclipse then and searched for my blog post that documented my first experience witnessing a total lunar eclipse. I was hence excited to be able to see it again tonight (hopefully possible). If you wonder what a total lunar eclipse is all about, it is in short, the alignment of the Sun, Earth and Moon, where the Moon will pass through the shadow of Earth (middle of the alignment). When this happens, the moon will turn dark and may become red due to the light scattered by the Earth’s atmosphere. 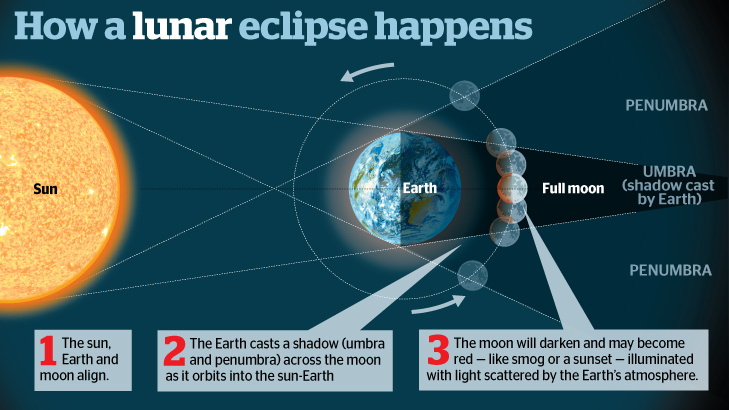 The illustration (taken off the Sydney Morning Herald website) will give you a clearer understanding on how the eclipse works. According to the Astro.sg website, the total lunar eclipse will happen today between 6.25pm and 7.24pm, peaking at 6.54pm. As the moon rise will be at 6.52pm, the total lunar eclipse will be low in the eastern sky. The Astronomical Society of Singapore (Tasos) has organised an observation gathering tonight for the rare total lunar eclipse at Labrador Park, near the Tanjong Berlayer Beacon facing Sentosa. Even if you are not able to make it there now, why not just look into the lower eastern sky around 7pm? You might be able to get a glimpse! Enjoy this “once in a red moon” experience! Previous articleEVENTSHands up for superheroes! It is such a pity that the sky is so hazy this evening. Thanks for sharing this Kiat Teng! Yes, it was a bit hazy yesterday. I was commuting on the train when the eclipse was apparent! Hope to catch a glimpse of it the next time! Hopefully the next one is visible from Singapore again! Your post was so interesting! It’s too bad I missed this one!!! Hope the next total lunar eclipse is not too far off in the future! Yeah, hopefully the April 2015 eclipse is visible from Singapore!